Disney and Jerry Bruckheimer Films present Pirates of the Caribbean: Dead Men Tell No Tales is a rollicking new tale of the high seas, infused with all the elements of fantasy, humor, and action that have resulted in an international phenomenon for the past 13 years. Johnny Depp returns to his Academy Award®-nominated role as the outrageous, swashbuckling scoundrel Captain Jack Sparrow, and is joined by Oscar winners Javier Bardem and Geoffrey Rush. 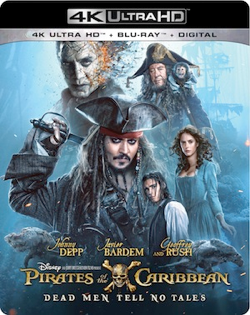 It was announced at D23 Expo that “Pirates of the Caribbean: Dead Men Tell No Tales”—the fifth film in the now-iconic “Pirates of the Caribbean” film franchise—will sail home on Digital in HD and 4K Ultra HD™ on September 19, and on 4K Ultra HD™/Blu-ray™ Combo Pack, DVD and On-Demand on October 3. BURBANK, Calif. (July 14, 2017) — From Disney and Jerry Bruckheimer Films, it was announced today at D23 Expo, that “Pirates of the Caribbean: Dead Men Tell No Tales”—the fifth film in the now-iconic “Pirates of the Caribbean” film franchise—will sail home on Digital in HD and 4K Ultra HD™ on September 19, and on 4K Ultra HD™/Blu-ray™ Combo Pack, DVD and On-Demand on October 3. Fans who bring home “Pirates of the Caribbean: Dead Men Tell No Tales” will experience the nonstop action in stunning 4K Ultra HD format, the ultimate home entertainment experience with next-generation high dynamic range (HDR) visuals and Dolby Atmos® immersive audio. The rip-roaring adventure—packed with humor, suspense and jaw-dropping special effects—finds down-on-his-luck Captain Jack feeling the winds of ill fortune blowing strongly his way when deadly ghost sailors, led by the terrifying Captain Salazar (Bardem), escape from the Devil's Triangle bent on killing every pirate at sea—notably Jack. Wings Over the Caribbean – Captain Jack has a memorable encounter with Sir Paul McCartney – rock 'n' roll royalty. An Enduring Legacy – Take one more look at the “Pirates of the Caribbean: Dead Men Tell No Tales” experience and the impact of “Pirates of the Caribbean” -- the movies, the ride and beyond. Disclosure of Material Connection: Wrapped Up N U received the product above or other compensation to facilitate the writing of a review. Some of the links on this post may be affiliate links. This means if you click on the link and purchase the item, I may (at no cost to you) receive an affiliate commission. Regardless, I only recommend products or services that I use personally and believe will add value to my readers. I am disclosing this in accordance with the Federal Trade Commission’s 16 CFR, Part 255: Guides Concerning the Use of Endorsements and Testimonials in Advertising. Johnny Depp is the best part of the movies. I just love him as an actor. I've always been a fan of pirate and seafaring movies! Errol Flynn and Johnny Depp are my favorites!